We are delighted to announce the new vintage release of two of our favourite Primo Estate wines, Merlesco Merlot and il Briccone Shiraz Sangiovese. 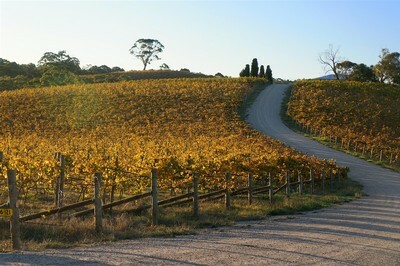 JOSEPH Angel Gully is one of McLaren Vale's 'Scarce Earth' wines. The 2009 JOSEPH Angel Gully Shiraz has been selected as one of 19 'Scarce Earth' wines - single-block wines that represent the best that McLaren Vale has to offer. This is the first white sparkling I've seen from Primo Estate and it's a winner. It has all the hallmarks for quality you've come to expect from Joseph and Dina Grilli. It's made in a Prosecco style but it is considerably drier than any Prosecco I've tried. It has a lovely fruit-forward bouquet and the aromas (later confirmed on the palate) remind me of the floral, perfumed richness of a Trebbiano grape. It's only RRP $20 and at that it's a steal. Click Here to order Primo Secco now! Despite approaching her 30th vintage in 2011, La Biondina shows that she is still 'full of life' and can capture the hearts of wine critics Australia wide with this latest mention in The Age, Tuesday March 29, 2011. "Colombard usually misses out when it comes to perceptions of wine quality but Joe Grilli of Primo Estate has elevated its status through La Biondina (the blonde). Made from grapes grown close to Adelaide, the 2010 typifies the style -- fresh, grapey, uncomplicated but full of life. Not quite as much passionfruit as previous editions, it's still succulent and zippy. 4 Stars." Click here to order some 'full of life' La Biondina for yourself! Long time fans of Italian Prosecco, Joe and Dina Grilli have turned their hands to the production of a delicate and aromatic sparkling wine with the same crisp savoury finish of the afore mentioned Venetian classic. Tyson Stelzer and Nick Stock go to town on Primo Estate and JOSEPH wines! Click here to order these wines for yourself today! Wine critic John Lewis from the Newcastle Herald has written a review of the Primo Estate La Biondina in the paper's February 5th issue. A lively, juicy and punchy young white from a variety that has never really caught the imagination of the public, other than for this label. It’s scented with a floral and gently herbal aroma of melon, citrus and light tropical fruit. Bright and breezy, its concentrated palate of citrus and tropical flavours has a round, unctuous quality that is neatly wound up by a trim, tart acidity. It finishes with a lasting impression of freshness and brightness. To order the 2010 La Biondina Colombard, please click here. Renowned wine critic Philip White has reviewed the JOSEPH Sparkling Red on his Drinkster Blog. Easily the pinnacle of Australian sparkling red, this astonishing wine holds select bits and pieces from over forty vintages, and only Bacchus knows eactly which varieties. Joe Grilli basically watched Robert O'Callaghan pinch the old recipe he learned from Colin Preece at Great Western, and with his typical gastronomic passion and rare intellectual rigour, outdid them both with finesse, complexity and consistency. While the legendary Rockford Black suffers fits of terrible cork, brettanomycaes, staleness and whatnot, the JOSPEH Red simply offers deadly velvety luxury and consistency the like of which you'd otherwise only expect in something like Krug. Like that mighty Champenoise wonder of the blending bench and reserve cellar, this wine manages to contain all that ancient base material, and yet pour in the most disarmingly fresh, matter-of-fact manner. One can glower over it, pondering, or simply sock it away with the sort of beetroot grin you'd earn at the most carnal bacchanale. Published bi-annually, our Con Brio (With Passion) newsletter is packed with stories and information about Primo Estate, new products and recipes.